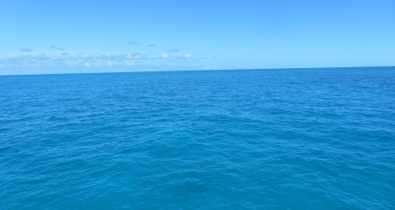 The view above is what we saw all day as we motored from Nassau to Highborne Cay. The photo on the left is looking straight down into the 25 ft. sea. 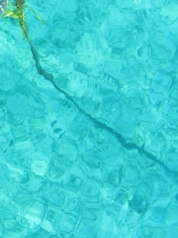 You can see the bottom very clearly and occasionally we’ passed over large starfish and sea rays. Highborne is at the northern end of The Exumas. When we left Nassau the last time we visited The Exumas, we went to Norman’s Cay which has a protected anchorage and a few things to look at ashore. We caught our first conch at Norman’s. Highborne seems to be popular with cruisers so we thought we’d try it this time. The beaches are beautiful, snorkeling is good, and there is a marina which we won’t be using. After shopping for groceries, we visited the two computer stores in the same mall. One had exactly what we need for our wifi extender, a 2.0 USB active extension cable. None of the computer stores had an unlocked aircard. One salesman said aircards are fairly new to the Central Bahamas. I have ordered one from Amazon and it will be coming to Staniel Cay from St. Brendan’s with our mail and a couple of other small items. Unfortunately, the cables didn’t fix our wifi extender so we have to try a few more solutions. We were a little late getting out of Nassau because of the shopping, but we were on our way by 10:40. 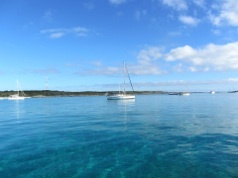 Most of the other sailboats headed to Highborne Cay and Allen’s Cay left at least an hour before us. Since there is very little wind, we didn’t have sails up. So far, we seem to be one of the faster boats while motoring, which is a huge thrill after being the slowest in the hybrid days. It is only 35 miles from Nassau to Highborne Cay, so at our motoring speed of 7 kts we arrived in five hours. There is no wifi in the anchorages, just at the marina. Our anchorage is seen on the right. There is plenty of room and there are only six boats anchored by us. There are several other anchorages at Highborne. The water is so clear that you can watch your chain as you let it out. We have 100 ft of chain out and are a good distance from the other boats here. 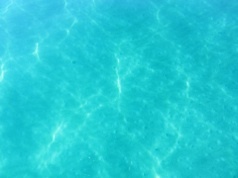 The bottom is partly grass and partly sand. Since there is no wind and very little current, we will sleep well tonight with no anchor alarms going off. A weather system is coming through tomorrow night, so we will skip several islands and go directly to Warderick Wells in the Exuma Cays Land and Sea Park. We’ll be able to stay on a secure mooring ball and have Internet service.